Our bodies have become virtual dumping grounds for the hundreds of thousands of toxic compounds around us. Every day our body is under constant assault from endless arrays of toxins from the air, water, the food we eat, and even the soil that nurtures our food. Though the body has a cleansing ability, it cannot keep up. As these chemicals build up, they alter our metabolism, cause enzyme dysfunction and nutritional deficiencies; create hormonal imbalances, damage brain chemistry, and other chronic illnesses. When the body is unable to excrete the toxins from the body, they find their way into the organs, and migrate to fat cells in the body where they are stored. The body auto-intoxicate itself when it exceeds the limit of toxins it can excrete. Auto-intoxication of the body can lead to physiological, psychological imbalance, and even chronic diseases. 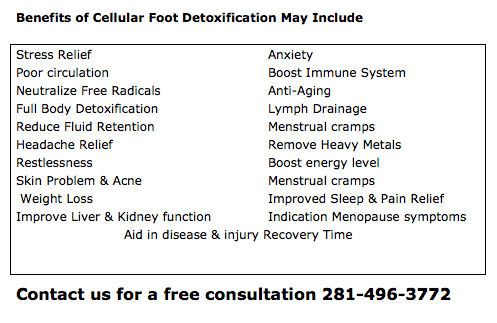 Cellular detoxification therapy, an alternative detoxification therapy can help eliminate some of these toxins. It uses reverse osmosis to draw out toxins from the body (through the wide pores of the sole of the feet). The therapy helps to cleanse the body of harmful toxins, balance the PH by decreasing the possibility of degenerative disease; reverse signs of aging, weight lose, and increase nutrient assimilation from food and supplements.